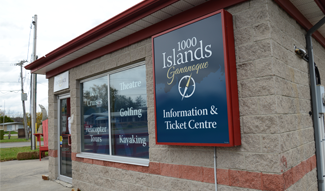 Start and end your 1,000 Islands experience with the Comfort Inn & Suites Thousand Islands Harbour District, located a few hundred metres from the Gananoque Boat Line docks and Gananoque Marina. 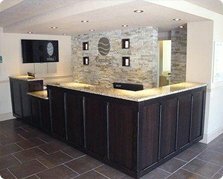 Offering 62 rooms (including hot breakfast and Wifi), other hotel features include an indoor heated pool, conference, fitness and business centres. The hotel is located adjacent to the new RIVA Restaurant and local shops. Standard rooms feature two queen-sized beds, with visitors treated to a free weekday newspaper, free coffee as well as free high-speed internet access, while some rooms include fireplaces or whirlpool tubs. Family suites are also available. 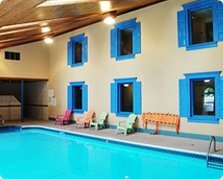 After a day of exploring the St. Lawrence River region, guests can relax by taking a dip in the indoor heated pool or using the on-site fitness centre. A restful night’s sleep is made even more enjoyable by waking up to the popular morning hot breakfast bar, featuring delicious waffles, fruit, yoghurt, eggs, meat and more. 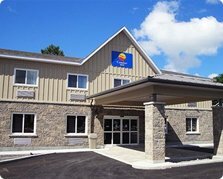 The Comfort Inn & Suites Thousands Islands Harbour District also welcomes business travellers. A board room, large banquet room, theatre room, and professional staff help to ensure productivity.